Earlier on Tuesday, we told you that Android models still own a majority of the market share for U.S. smartphones with a 53% slice of the pie. Right behind the green robot is iOS with a 29% marketshare. Based on stats like that, you might think that app developers would prefer to write for the green robot as the lead in marketshare could translate into more sales and therefore more money for the developers. But based on a survey done by Flurry Analytics, developers still select the iOS platform as their favorite. Flurry's research reveals that 75% of new mobile app projects using Flurry's Analytics software used the iOS version of it during Q3 of this year. 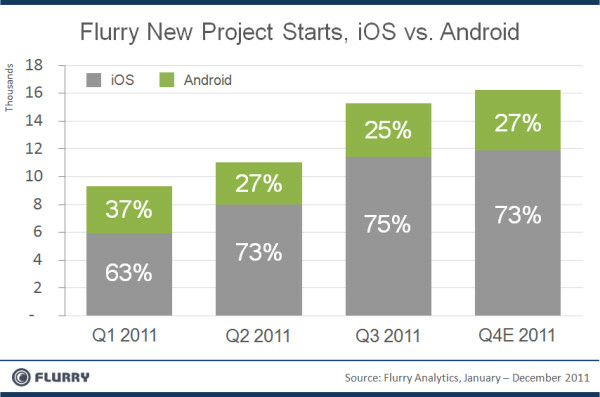 That is up from 63% of new mobile apps that used the iOS version of Flurry's software earlier this year. Google Chairman Eric Schmidt recently said that developers would favor Android in 2012 because of its lead in marketshare, but that doesn't seem to be the case so far. Money might play a large part in this favoritism toward iOS. 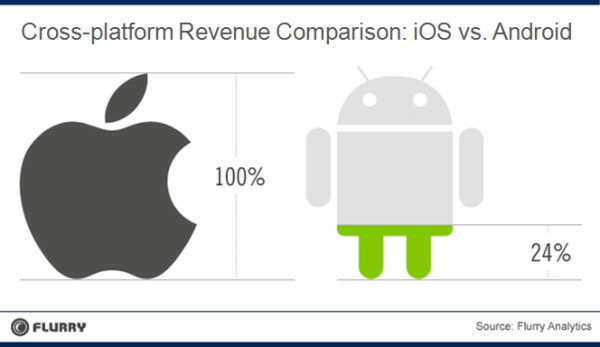 Flurry's metrics show that more money is spent on the iOS platform than on Android. For example, for every $1.00 that an app brings in on iOS, it generates just 24 cents on Android. Some of the reason for this is the easier payment method that is found on the App Store although Android is working on closing the gap using Google Wallet. My idea is that homosexuals spend more money. It seems every story on here has someone who makes such a post just so he can get thumbed down. your an idiot. excuse enough? google needs prepaid cards. That's one thing that helps apple a lot in this dept, all the kids with the phones their parents bought them spending their money on apps and such with itunes cards. I don't know how it will be, since I can't predict the future. But he probably said 2012 because of ICS, since Android is the smarphone marketshare leader for a while. I wouldn't dare to make that kind of assumption on an uncertain future. If Android keeps this growth its market will be huge. I don't see why wouldn't developers make an Android version of their preexisting iOS apps. It would be kind of a win-win situation for them. I believe this is already happening with smartphones as we can see more apps being ported to Android. Unless Apple starts to give some kind of privilege (Infinity Blade) to stay on iOS only. 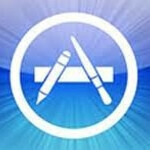 Devs may not get as much money from Android as on iOS. But they will get more money if they develop for both. And if you don't like the ads, there is usually a paid no-ad version. People just usually prefer free things. Go figure. Lol. Developers know one thing: the App Store pays (a lot), the Android Market doesn't. It's that simple. You didn't need to make a ton of wild assumptions to reach that conclusion. Independent thought frowned upon? Sounds like a typical Apple user. How do you guys keep from crashing into each other with your hive mind leader Jobs dead? @Doakie Comments like this are really getting irritating. Let me guess you love Android? It was your first smartphone because your mom didn't give you enough money for an iPhone. You use Android because it is SO open source but keep using your Windows machine. Just be quiet and go to bed, you have school in the morning. I respect both Doakie's and your viewpoints. However, what sort of ticked me off was this: "Let me guess you love Android? It was your first smartphone because your mom didn't give you enough money for an iPhone." Come on. For a lot of people, an android phone is not a consolation for not being able to have an iphone. AND, most android users THINK before buying a phone, to be able to acquire what best suit their preferences. That's the beauty of android. You get to choose. You want a big screen? Get a 4.3 incher or bigger. You want something compact, get a smaller handset. You want a good camera, get the best android camera phone. Etc, etc... And then, when you've bought your phone, you can customize it even more, even if you don't root it. One more thing, android phones tend to be sturdier than iphones. You can brag about the design of your delicate glass phone all you want. Until you drop it and it shatters to a million tiny pieces, and looks ugly and unusable. Drop an android phone, and almost always, you wouldn't even see a dent when you pick it up. So please, refrain from saying someone owns an android just because s/he can't afford an iphone. Some android phones cost as much, or even more than, an iphone. And those sell like hotcakes! Even with a lot of other android handsets available! *coming from someone with a fairly customized non-rooted android phone, an ipod, and a windows pc he built himself. It's all about the money. If I want to make money, I'd choose the platform that will generate the most revenue for me. It's as simple as that. If the Android market share continues to grow to a point where revenue from Android exceeds that of iOS, then I will target Android. There may be other things that Google can do to help with revenue as well. We'll have to see what else they can do. your theory is sounds good when you say it like that, but theres the added hurdle of what devices support your apps, this problem was encountered by the developers of the facebook app for android, they were overwhelmed by the amount of devices to support. Do we have to see this same old story EVERY month??? This one and the "Android is the leading OS article are regulars on PA, but there is never anything new to add to the story. Let us know when something changes. aah another crap story from alan f. Why does Eric Schmidt think that? not purely because of market share - BUT every new/2011 high spec model will be running ICS. Everyone knows the reason developers choose ios over android because of the different platforms, it makes it hard for developers to handle eclair, froyo, gingerbread, honeycomb now ICS. Once all are running ICS, developers will start coming to android first to reap the benefits of that high market share. so shut up Alan, get your factsright. so after reading the entire original article, the article states that the biggest driver to iOS isnt "quality" or "security", its "ability to pay". Apple DEMANDS that you put a credit card to iTunes and wont let you set up without it.. so all iOS users are pay enabled. Google, in typical google fashion, doesnt force you to set up a pay account. You can if/when you want. So an iOS user is more likely to buy something than an android user for that fact. I got no issue with that data. it seems pretty obvious. Once the card is set up its really easy to just "hit the button" and buy it. People stop thinking about it. However, this like many things, only tracks one vendor's app making program, and only paid apps, so its not a total picture. Again, the bulk of the android market is free and ad supported. It is a different culture. And again, if you ask companies like Rovio, you can make MILLIONS on ad support if you make a good program. So in a way, android apps have to be high quality to make money. On iOS, you make a crap app for 0.99 and you get people to buy it to try it. On android, that app is free with ad support, but if its a crap app, no one will play with it long enough for you to make money. So before you start rolling off in super - duper - troll mode, think about that for a sec. See? I was right. All you see here are list of excuses from fandroids, hahahahaha. If you really want to make money then you should learn how to make an iPhone app. This class has taught people how to make apps in 1 day! Apple is bigger than Samsung! Making an app for the iPhone is easy. Checkout this class: sfiphonebootcamp.eventbrite .com This class has taught people how to make an app in 1 day. Why work for the man, when you can be making your own money.